Beautifully printed in 4 colors on heavy white poster board. (This digital e-photo can't show the sharp, high quality printing). Can be mounted on foam board for easel, or taked to a board or wall. 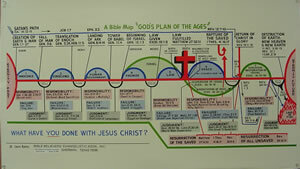 Used in churches and homes for Bible classes with the pocket size, folded "Bible Map-God's Plan of the Ages" tracts. Thousands of people have been saved and given an overview of God's Word during the last 31 years with the use of this teaching material. The folded, pocket size Bible Map tracts are even more effective for Bible classes in small group classes, as in Sunday School and home classes, when used with this 22 x 38 inch Bible Map Poster.